Using one of the city’s many stalled construction sites as a home, the farm of New York’s Riverpark restaurant supplies the kitchen with fresh produce, without having a permanent home. Savvy urban restaurateurs from New York to California have recently discovered that growing their own produce, whether on a rooftop farm or a neighboring site, is easier than trekking to local farmer’s markets or buying from suppliers–and it provides lots of publicity. When Sisha Ortuzar and Jeffrey Zurofsky, partners at the popular ‘wichcraft chain, decided to open up a new restaurant, they too sought out their own farm space. 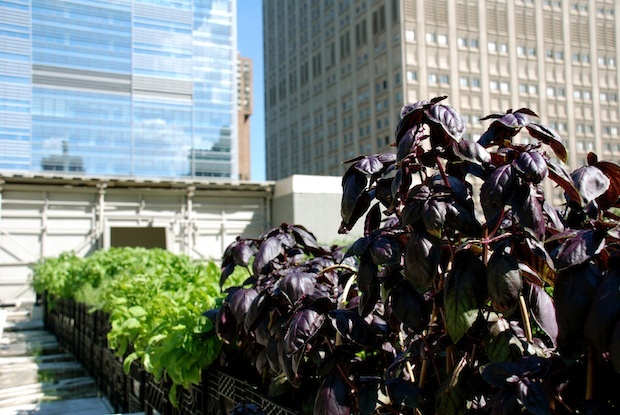 But instead of building a rooftop farm, the Riverpark restaurant team opted to take over a neighboring construction site that had lain idle for years, fill it with milk crates, and grow piles of produce. The 15,000-square-foot farm, located next to the new Riverpark restaurant, is on land that will eventually house a building in the Alexandria Center for Life Science, an office and lab campus for the life science industry. Alexandria Real Estate Equities, the company that is building the campus, agreed to let Riverpark use the future site of the West Tower for the farm. But the agreement came with a catch: The Riverpark farm couldn’t plow the ground or dump loads of topsoil inside. The farm had to be completely modular and portable. The Riverpark creators decided to start the plants in a nursery farm upstate before bringing them over to the urban environment earlier this summer. The farm now contains 7,400 milk crates and over 100 types of plants. Riverpark currently gets about 25% of its produce from the farm, but expects to get more soon. harder to find for us, for example, lemon verbina, which is impossible to find right now. There are now 92 lemon verbina plants on the farm.” Other crops grown by the farm’s two full-time farmers include tomatoes, eggplants, zucchini, cucumbers, and a variety of greens. The project is, as far as Alexandria Real Estate Equities knows, the only one of its kind in New York City. “There are over 600 stalled sites in New York City right now, and we have not heard of any developer at this point making use of them,” says Scarlet Shore, executive director of the company (not to mention the 596 acres of unused public land). But of course, the farm can’t stay in the stalled site forever; Alexandria expects to begin construction of the new tower as soon as it finds an anchor tenant. 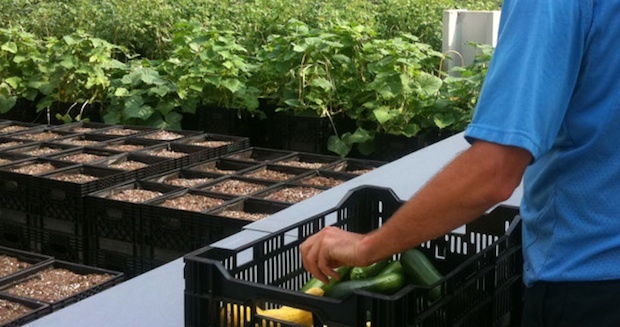 The Riverpark farm has been planning for this–Alexandria is allowing the restaurant to simply pick up its crates full of produce and move to another location on the campus.